Decorative Engineering & Supply, Inc. offers a variety of dollies and carts to help handle the material that you are spraying. 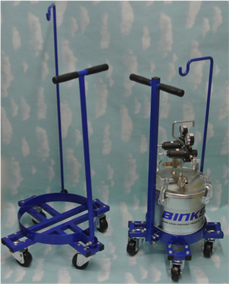 Whether you need a cart to accommodate your pump with a couple of 5 gallon pails mounted on it or you want to have a dolly to move your pressure tank around the work area, give us a call and we'll get you set up. 2-Gallon and 5-Gallon tank dollies offer a solid base and swiveling casters for mobility, lid support hook to allow for easy refilling of the pressure tank without making a mess and a handle that will lock in the upright position.